As an HR Technology enthusiast and recruiting practitioner, the idea of requiring candidates to record themselves answer one-way interview questions has always troubled me. I’ve always considered one-way video interviews to be a terrible candidate experience that deter the best and brightest and that send the wrong message to my executive team. If you’ve ever had to record yourself answer video screening questions (when it counted), you’ll agree – it’s a soul-crushing experience. I’m not talking about Skype interviews, those are great two-way, live conversations. For folks who don’t know about one-way video interview technology, here’s a quick introduction. A job candidate expresses interest in your organization by completing a lengthy job application. A Recruiter then bulk invites candidates to screen themselves by videotaping answers to a set of required interview questions. Candidates sit in front of their computer, read off each question and the web application captures video recordings of a candidate’s answer. Recruiters can then review these answers and decide which candidate’s are worth real (two-way, live) phone conversations. On the surface, one-way interviews sound like a pretty sweet deal for the recruiter. Wow, I don’t have to talk to as many candidates. Cool, I can get to know their communication style, before I talk to them on the phone. This will help weed out the bad candidates. Because it’s a stressful experience, we can see how the candidate acts under pressure. If you’re not willing to complete this step, you don’t really want to work for our company. 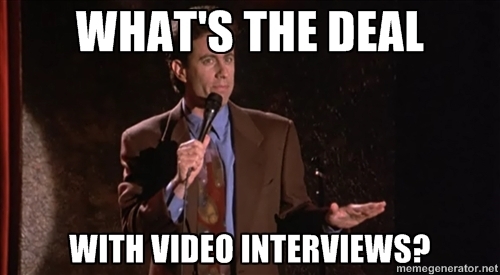 We can only gauge a candidate’s ‘culture fit’ from video interviews. This will show my executive team that I’m efficient and I understand technology. However, take a step back and think what this says to candidates, hiring managers and the executive team..
I’m a Recruiter, but not that interested in actually talking to candidates. We’ve added an additional step for applicants, to save the Recruiter some time. The applicants need a job more than we need them. We’ve invited 50 other candidates to also participate in this step, since it’s no skin off our backs. Candidates have one shot to say the right thing, that’s how our organization determines ‘fit’ and judges qualifications. Talking to a computer is an acceptable comparison to communicating with another person. We’re not concerned if applicants have questions about the company, team or hiring manager. Furthermore.. what message is this sending to executives at your company? It’s becoming increasingly clear that Recruiters and HR Business Partners must prove their value to the firm. To be considered a vital contributor, the last impression I’d want to make is that the candidate screening process can be effectively outsourced to that of a computer. Instead, Recruiters should be focusing on ways to dive deeper into the roles and functions we recruit for, tools to conduct in-depth candidate assessments and opportunities to make every candidate conversation count. If you think magic algorithms for sourcing and automated candidate screening are the future of recruiting.. we should all start exploring new career opportunities. At Honeit, we are building real-time interview tools to help Recruiters conduct more effective two-way phone screens that remove bias, save candidates and hiring managers time and frustration, and improve the interview experience for everyone involved.